Painting directly from nature can be a reverent communication with the land. This is a process of the seer, seeing, and the seen in one great act of celebrating or attempting to capture the wonder of it all. Requiring humility, patience, and an openness to hear nature’s song; the land can awaken the senses and feed the soul. Our paintings can often appear inadequate when compared to the real thing…but, after the sun has gone down preparing for another day, our paintings have captured a sense of realization of a place-in-time and our interrelationship with this wondrous planet. Avoid the arrogance (and often disappointment!) of trying to knock off a masterpiece at first arrival. Patience is part of the process. If a inspiring scene just appears out of the heavens then waste no time get started. Take the time to create comfortable seating (or standing), with good posture in possible shelter. Set up tools in a practical way so that you are able to respond and paint quickly and look for interesting arrangements of shapes and values, foreground and possible multiple viewpoints. What is so unique to outdoor painting is the awareness created as a result of anticipating the position of sun, the cast of shadows and the overall effect of the weather. Often as light changes so does the location. Many artists have a morning and a late afternoon painting on the go. Look for interesting arrangements of shapes and values that will inspire exciting composition. Get started with a few quick 5 minute shape reading exercises or thumbnails value studies before starting. Then gaze and compare and relate arrangements of light and dark coloured shapes. Often it’s the edges of shapes that create directional lines that lead to expressive journey through the hierarchy of focal points. 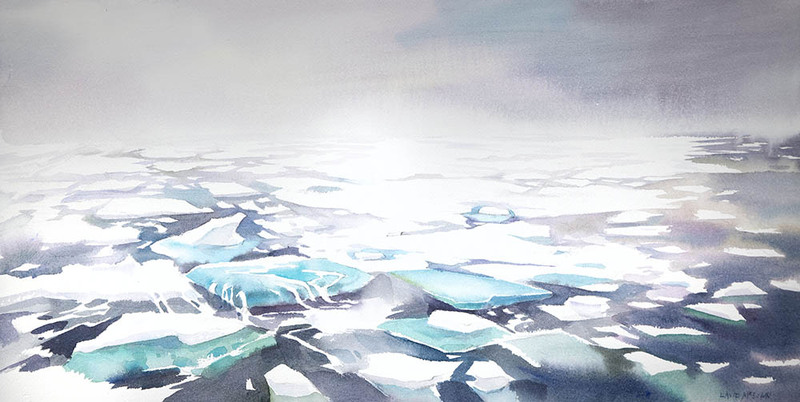 A great example was this past summer; I had the great opportunity to join One Ocean Expeditions in Svalbard for their Photo symposium and an “Art in the Arctic” program. Along with the accomplished UK artist Bruce Pearson, we organized art workshops and engaged with our fellow passengers, painting on the ship’s outer decks and even during our Zodiac excursions. We had some fantastic polar bear, walrus and bird encounters while onboard the Russian vessel Akademik Vavilov. 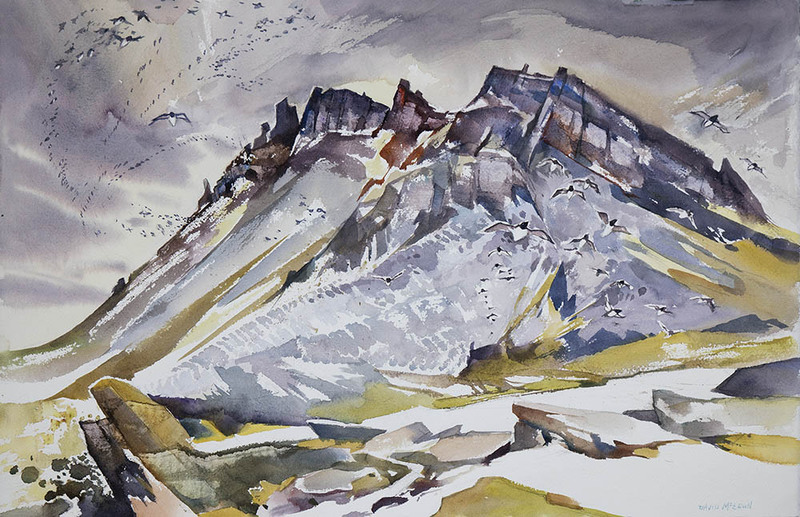 More paintings from Svalbard and other dynamic locations in the arctic are posted on my the Arctic page and check out the video from South Georgia Island below! Many thanks again to the team at One Ocean Expeditions for guiding us throughout Svalbard! 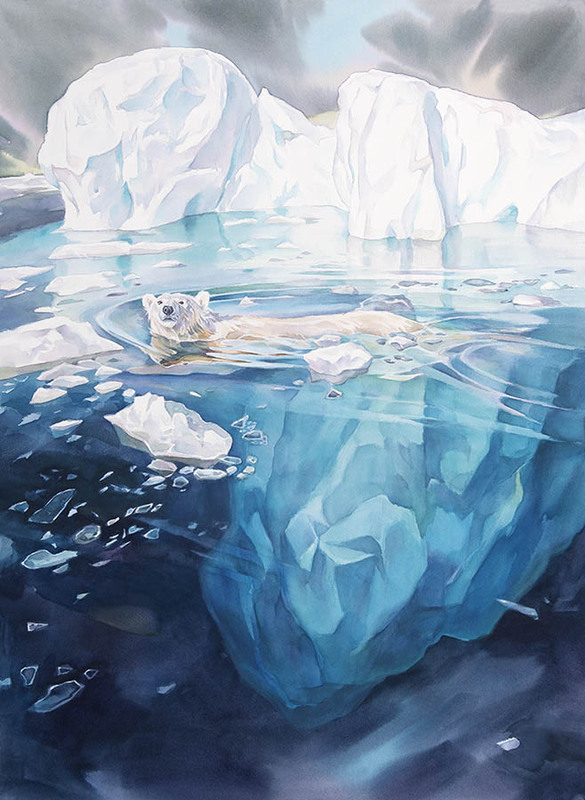 Check out my program “Watercolour as a Path to Awareness” in May 2019!